Here is some code to compute the cotangent weights described in the article Discrete Differential-Geometry Operators for Triangulated 2-Manifolds. Cotan weights are the most popular expression of the discreete Laplacian operator on triangle meshes. Cotangent weights have many application such as mesh smoothing, computing harmonic weights over a mesh, or diffusing values on its surface. I'm leaving this here for other tutorial to reference. A cotangent weight can be thought as barycentric weights, for every vertex \( i \) we associate the weights to each of its direct neighbor \( j \). The code below does not compile but hopefully it can serve as a reference to adapt it to your own project. The code below also handles cotangent weights at the boundaries of the mesh. /// For every vertex, a list of direct (1st ring) neighbors. // compute the cotangent value close to 0.0f and pi. 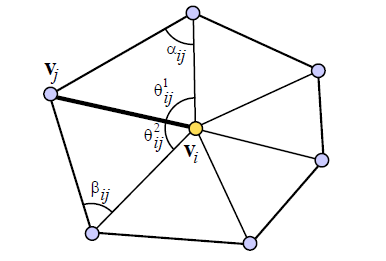 Note that sometimes cotangent weights can be negative and causes instabilities for certain configurations of triangle meshes depending on your algorithm (For instance gradient descent that won't converge correctly). // forming the angle alpha. // compute the cotangent value close to 0.0f. "Easy to forget the beginning of a thread"